Serena William’s Wimbledon final triumph over Angelique Kerber was not just not another win for the American. Apart from it being her seventh Wimbledon title, it was a victory that earned her her twenty-second major title, thereby tying with Steffi Graf (who had singularly held the record for the past seventeen years) for the most titles since the introduction of the Open era in 1968. In a match that ensured spectators and millions of viewers around the world were riveted to the game before them, the younger of the Williams sister’s victory after losing the U.S Open last year, and the Australian Open in January had her fans heaving a sigh of relief that the 34-year old finally equaled Graf’s record and moved closer to Margaret Court’s all-time record of 24 grand slam titles. William’s achievement couldn’t have come at a better time. At a time when the black race appear to be wandering in the wilderness of blatant rejection, especially in a country that is quick to project itself as the land where anybody’s dreams can come through regardless who they are or where they come from, but has proven by its body language that that is fast becoming a thing of the past, the black race is badly in need of more iconic and inspirational figures who can show them that the colour of their skin is not a curse after all. 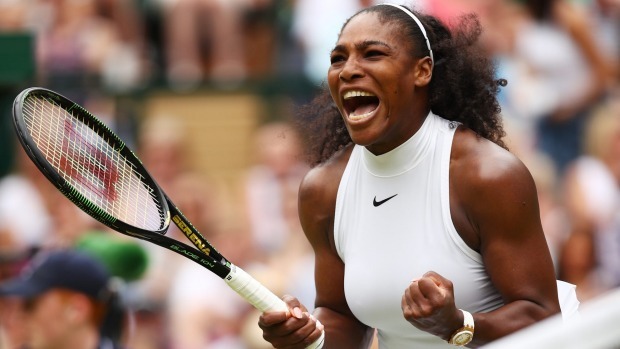 With the passing of legends like Micheal Jackson, Whitney Houston and Muhammed Ali who excelled in their craft in spite of their struggles, it’s refreshing to see notable black symbols like Serena step up to offer renewed hope to blacks. I am a huge fan of the William sisters. Serena in particular. It is pointless to deny it. I have spent a considerable amount of time studying her childhood and rise to prominence, and I see the story of a girl who just didn’t give up. I mean, she’s black like me. Could have been a class mate if we were in the same country, and while the circumstances of our childhood and country of birth might be different, essentially it’s the same story of a little black girl trying to make her mark in a big, scary world. In fact, her circumstances were probably more difficult. I cannot remember ever having to deal with racial slurs and derogatory comments on account of the my skin colour, even on the occasions when I have been in the white man’s land. Serena has had to deal with that all her life. And while she hasn’t had to contend with epileptic power supply, non existent water supply and fuel scarcity, the bottom line is – we all have our individual and collective struggles regardless of our geographical location. It’s the way we react to these challenges that ultimately determines our lot in this conundrum called life. While the families and indeed the black race in general continue to mourn and protest the unjust killing of Alton Sterling, Philando Castile and many others, it’s imperative that the rest of us find the strength to trudge on. Because, frankly, even if systemic or institutionalized racism is eradicated, subtle racism will never go away. At best, it would be reduced to the barest minimum, showing up in form of covert discrimination from time to time. William’s spin on racial antipathy can act as a catalyst for our weary souls, for she is one who has borne the weight of racist remarks, innuendos and misogyny with so much dignity. The incident at the Indian Wells tournament where the William’s family were booed and taunted by the crowd when Venus withdrew from a match against Serena leading to them to boycott the event for 14 years readily comes to mind. Serena has also had to deal with scathing critiques of her body, with haters attempting to shame her for the way she is physically built and often times calling her unattractive and masculine; not to mention her market value when compared with (the now banned) Maria Sharapova, who before her ban was preferred by many brands, despite being vastly inferior to Ms Williams on the tennis court. Her personal life is almost always under microscopic scrutiny by the ubiquitous paparazzi. She has also had to contend with countless injuries, including a life threatening health scare which forced her to take a year long hiatus from tennis in 2010. The world no.1 female tennis player could have thrown her hands up in despair and given up on her career, buckling under the weight and pressure of her personal troubles and an often hostile environment. But she didn’t. Rather, she kept her eye on the prize. Never losing focus. It’s instructive and worthy of emulation. The black lives matter movement is as important as it is necessary; but beyond that, the black race must keep its head up and refuse to internalize the victim mentality. I have always belonged to the school of thought that believes that the best way to shut critics up is by being a force to reckon with at what one does. It’s the classy way to wave the middle finger. Blacks must make a conscious effort to shed the reputation of being wastrels who lack ambition. Drug traffickers, prostitutes and irresponsible baby daddies should not be representative of the black race. Even though Serena Williams will always be remembered first for her tennis, her greater legacy may be what she has done with her platform – her willingness to speak out on social issues, her can-do spirit and never-say-die attitude is the hope she offers to her ilk. The curtain of inequality, violence and racism may never be lifted totally, but we can choose to do our best to rise above it while we still have breathe in us. And we can only do this through sheer grit and the audacity of belief in our limitless capacity. Serena is synonymous with positive rebellion, grit and greatness. It’s a brutal, unforgiving world out there for blacks in particular, and people like Serena have found a good way to combat it. It’s a path that has clearly worked for her. It’s a path we may all want to explore. Thank you so much Yemi. I think cops need to do serious psychological tests before they enter the force because i really don’t understand how in an age of interconnectedness and interdependence, someone is discriminated by virtue of skin colour or where he comes from. This doesn’t just apply just to the United States but the world all over. It’s just ridiculous to racially abuse people who have contributed meaningfully to society, that has given the country a name on the globe. Assuming France won the Euro, I can’t image French nationals chanting racial slurs at a squad composed of many black players. Would be very absurd. Serena Williams is a go getter pure and simple and whatever bad experience she might have had in the past have molded her and have contributed in making her a success story today.